New 2017 Renegade Toterhome on a Freightliner Cascadia cab with 550hp / 1850 ft. lbs. torque and a 13 speed Eaton Fuller Ultra Shift Plus transmission. 14' Living Quarters with 2 - 18" slides. We have learned through our racing and customers that the 14' living area with bunk over, sofa hide-a-bed, dinette drop down, full size fridge, cook-top, and full bath with separate shower, is the perfect set up. This also keeps the overall length down to 32'4". 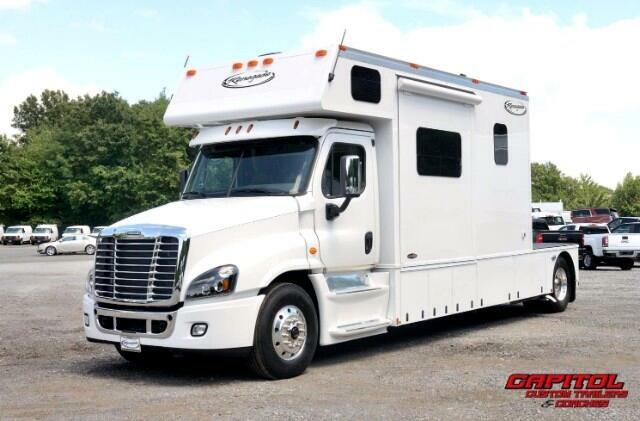 Again, the perfect rig with the comfort of the Cascadia Cab, Horse Power and Pulling Power, and Comfortable Living Area. We here at Capitol Renegade have the racer in mind when building new inventory. Message: Thought you might be interested in this 2017 Renegade Toterhome.